SX Racer project has long been finished, the motorcycle is already in good hands of its new owner, so now it's finally the time to show you what we did. A detailed video review will be later, and now let us show you a short teaser. After the test drive, we gained some new experience and knowledge that will be useful to all customizers. It is better to put adjustable clip-ons, especially if there is more than one person riding the motorcycle, like in our situation. Ordinary clip-ons (regardless of height) on Bonneville Triumph are a bit far for motorcyclists shorter than 170-175 cm. 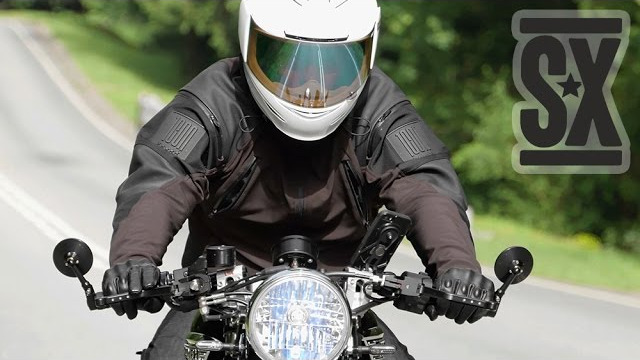 Adjustable clip-ons are ideal for adjusting the handlebar just the way you need it! The well polished wheels look amazing, but only if you keep the motorcycle in a garage. Otherwise they will quickly get dirty if you keep it outside. Adjusting the speedometer on the Motogadget dashboard is very easy. There is no need to set any numbers, it is enough to drive 10 seconds at a speed of 50 kmh on the navigator in the training mode, and the device adjusts to the standard speed sensor itself. Russian license plate is a great mudguard. In the rain, it protects your back and your bike from splashes. Diode optics shines brightly and clearly visible in the traffic line, despite the compact size. We've done some serious work while customizing SX Racer, and we'd be glad to help anyone who wants to make something similar.